"I had never roasted a turkey before so I needed an easy recipe. This recipe was ... read full review"
Preheat oven 500°. Wash turkey inside and out. Dry completely with paper towels and rub salt throughout inside cavity of turkey. 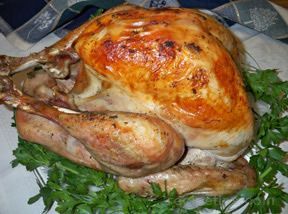 Brush the outside of the turkey with melted margarine. Place turkey in a large roaster pan. 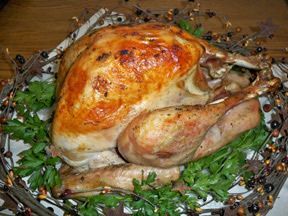 Pour water around turkey and cover tightly, making sure no steam can escape. Bake in oven for 1 hour. After 1 hour, turn off oven and let turkey sit in oven and roast for 3 hours. Make sure not to open oven door during the 3 hours. Makes 12 or more servings. "I had never roasted a turkey before so I needed an easy recipe. This recipe was perfect for me. It required just a few ingredients and was simple to follow. I was really happy with how it turned out, especially for my first turkey."